Recognizing a good business opportunity, Quark (Armin Shimerman) takes credit for killing a Klingon customer, Kozak (Jan Landale Bennett), who dies in the bar accidentally. Thrilled with his newfound popularity, Quark ignores Odo's (René Auberjonois) warning that the Klingon's family might retaliate. Sure enough, Kozak's brother arrives and tells Quark that his wife will only be spared if Kozak died honorably in battle. When Kozak's widow (Mary Kay Adams) discovers the truth about her husband's death, she forces Quark to return to the Klingon Homeworld to marry her. Now, as the head of his own House, the terrified Ferengi must defend it to the death by facing his enemies in mortal battle. While experimenting with a keyboard, Dax (Terry Farrell) inexplicably plays a melody from memory though she has no formal musical training. After some frightening hallucinations, she asks Bashir (Siddig El Fadil) to examine her and he discovers that her levels of isoboramine, a neurotransmitter that mediates the synaptic functions between Jadzia and the Dax symbiont, are dangerously low. Returning to the Trill Homeworld, Jadzia is administered a drug to boos her isoboramine levels. 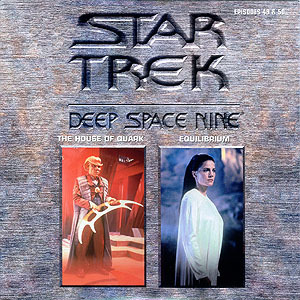 But the hallucinations continue and Bashir and Sisko (Avery Brooks) discover that a deadly secret from Dax's past could mean the end of Jadzia's life - and rip Trill society apart.